Rockfax describe the bouldering at St. 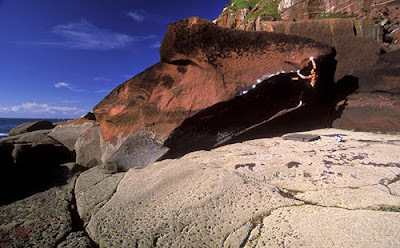 Bees as one of the nicest bouldering locations in the UK. The tidal ledge is a sun trap under the 100m cliffs of St. Bees Head, with just the sea and the seals for company. 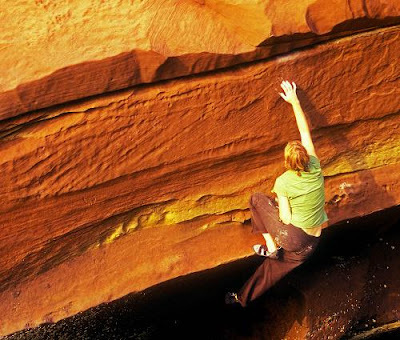 The boulders are sandstone, often highly featured and mostly very solid with great variety of crimpy walls, technical aretes, delicate slabs and burly overhangs. There are probles across the grades, with plenty in the V1 to V5 range. Due to bird nesting restrictions the meet will take place between Apiary Wall and Fishermans Steps areas at St. Bees North Head. There is information on the Lakes Bloc website including pictures and a guide book(PDF). Information can also be found in the Rockfax Lakes Bouldering guide, and the new Buttermere & St. Bees guide. 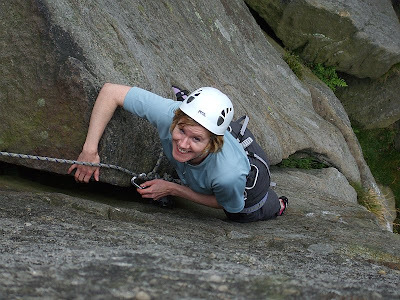 Lake District Rock (p. 305) also has information regarding the approach and the sport climbing. Directions: From Whitehaven follow signs to St. Bees and then Sandwith. From Sandwith, take the private road by the phone box all the way to Tarnflatt Hall Farm. Please park here sensibly. From the farmyard follow the continuation path road on foot to the lighthouse. Carry straight on down a concrete path to the foghorn station. Turn north and cross the wooden fence just north of the foghorn station. Follow the path by the fence for 50m and cross the fence (there may be a stile). The path dives off down a short gully and under a small crag, heading north until it starts to descend steeply towards the sea (knotted fixed rope on the steeper sections). A less steep descent follows the coastal path north of the foghorn station (on the landward side of the fence). Cross one stile and after a short distance leave the coastal path by climbing a stile over the cliff-top fence. A path leads down to sea level. The Fishermans Steps approach is hazardous and bird banned, as is all climbing south of this path. 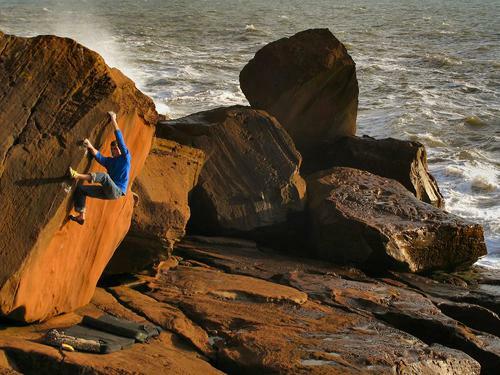 Mark, AndyO, Johnny and Graham have been getting a lot of bouldering done in 2011 and have supplied us with a little video of their latest outing to Newstones. More videos of members and their friends can be found via the Club's YouTube Channel. In the absence of any other better suggestions, we held our early season Beginners' Climbing meet at Burbage North. The meet will started at 10:00am in the car park at Burbage Bridge(GR: SK260829) and then we walked along the old carriage drive to gain access to Burbage Rocks(see the maps below). 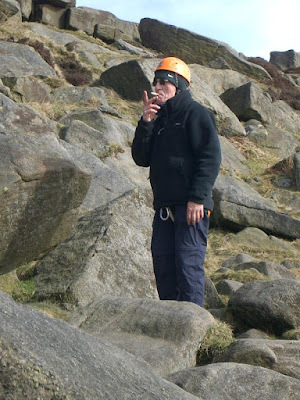 See our blog for a report on last 2007 meet and also a Burbage Meet from 2008. Refreshments were available at the Yorkshire Bridge Inn near Bamford, on the way home.